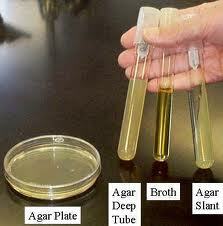 Bacterial growth is studied by analyzing the growth curve of a microbial culture. Because no fresh medium is provided during incubation, nutrient concentrations decline and concentration of wastes increase. The growth of microorganism reproducing by binary fission can be plotted as the logarithm of the number of viable cells versus the incubation period. The resulting curve has four distinct phases. Phase 1: The Lag Phase. When microorganisms are introduced into a fresh culture medium, usually no immediate increase in cell number occurs, and therefore this period is called lag phase. Although cell division does not take place right away and there is no net increase in mass, the cell is synthesizing new components. A lag phase prior to the start of cell division can be necessary for a variety of reasons. The cell may be old and depleted of ATP, essential co-factors and ribosomes; these must be synthesized before growth can begin. The lag phase vary considerably in length with the condition of the microorganism and the nature of the medium. 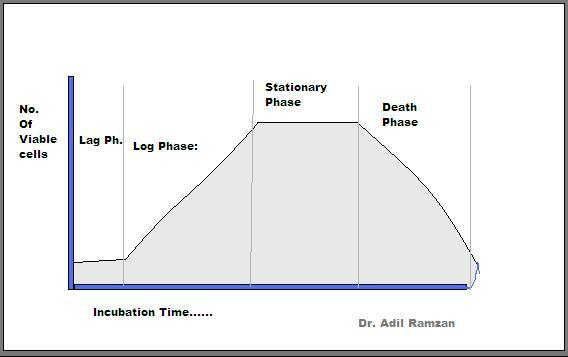 Phase II: Exponential or Log Phase. During the exponential or log phase, microorganisms are growing and dividing at the maximal rate possible given by their genetic potential, the nature of the medium, and the conditions under which they are growing. There rate of growth is constant during the log phase; that is microorganism are dividing and doubling in number at regular intervals. Because each organism divides at a slightly different moment, the growth curve rises smoothly rather than in discrete jumps. The population is most uniform and in terms of chemical and physiological properties during this phase; therefore exponential phase cultures are usually used in biochemical and physiological studies. This growth proceeds until the nutrients are available in sufficient amount. Eventually population growth ceases adn the growth curve becomes horizontal. this is called stationary phase. This stationary phase usually is attained by bacteria at a population of around 109 cells per ml. Other microorganisms normally do not reach such high populations densities; protozoan and algal cultures have maximum concentrations of about 106 cells per ml. Of course final population size depends on nutrient availability and other factors as well as the type of microorganism being cultured. In the stationary phase number of viable microorganisms remains constant. This may result from a balance between cell division and cell death, or the population may simply cease to divide though remaining metabolically active. Detrimental environmental changes like nutrient deprivation and the build up of toxic wastes lead to the decline in the number of viable cells characteristic of death phase. The death of a microbial population, like its growth during the exponential phase, may be logarithmic, (that is a constant proportion of cells dies every hour). This pattern in viable cell count holds even when the total cell number remains constant because the cells simply fail to lyse after dying. Often the only way of deciding whether a bacterial cell is viable is by incubation it in fresh medium: if it does not grow and reproduce, it is assumed to be dead.